The six-sided hexagon is a favorite of the natural world, from honeycombs to snowflakes. These samples are worked in rounds from the center out, forming a brick-stitch sort of lace. While every “unit” has the same number of beads, each round will have six increase units, one at each corner, to keep the netting flat. The honeycomb pattern is easier to create using hexagonal netting instead of right-angle weave, and can be used for a variety of beaded jewelry design ideas. It is safe to say that bead netting has been around for several centuries. It can be found in almost every culture on the globe and is something that can be done off loom. What I love about it is that it gives the appearance of 3 dimensional lace. 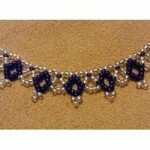 This beaded necklace looks intricate, but it is extremely easy to make. Although it looks luxe, the necklace is also inexpensive to make, since all you need are seed beads, thread and a beading needle. It is beaded using a simple netting stitch, which is common in Ukrainian and Russian beading. If you’re new to netting, this is a good project to get you started. Get your supplies together and let’s make jewelry! Various designers around the world have put them through their paces, to check they work up well in lots of different stitches. I’m loving them in Albion stitch, and Netting, they bring a whole new dimension to Right Angle Weave, and they are the perfect bead for bead embroidery lovers… It’s been an age since I did some bead embroidery and now I can’t resist! I’ve had quite a few people ask me how to do 2-bead netting. So here’s a tut. I’m not claiming to have invented this. Was just wondering what would happen if I left one bead out of the 3-bead netting. This simple beading pattern will teach you how to make this stunning “Captivated” holiday ornament! With over 30 high resolution full color photos and easy to follow step by step directions, you’ll be able to make your loved ones a special holiday heirloom ornament that they will surely treasure for years to come! Happy beading! Netted Necklace design in the making, part 1 of 2 beading tutorial. Beaded spiral with twin beads. You can variate endlessly with the colors, pattern and core of this bracelet or necklace!